Hibiscus tea, popularly known as Zobo drink in Nigeria, is a drink that is greatly cherished by most people from that part of West Africa. Zobo drink is a herbal tea that is made by boiling parts of the hibiscus plant in water, and the drink can be enjoyed either hot or cold. Various studies and research has uncovered lots of health benefits that are linked with the drinking of hibiscus teat or zobo drink. Such health benefits ranges from lowering of blood pressure, fighting bacteria and even aiding weight loss. Set your eyes on these 5 amazing health benefits you can derive from drinking zobo drink. Zobo drink contains lots of antioxidants. In case you do not know what antioxidants are, they are molecules that help fight compounds that can cause damage to your cells. Such compounds are known as free radicals. This simply means that hibiscus teas benefits the human body by preventing damage and disease caused by the build up of free radicals. One of the most amazing health benefits of hibiscus tea is that it may assist in the lowering of blood pressure. High blood pressure is highly detrimental as it can cause extra strain on the heart and cause it to weaken, thereby making you vulnerable to heart disease. The main function of the liver in the human body is to detoxify your system from various toxins. Once the liver gets malfunctioned, you are then exposed to many disease that can cause great harm to your body or lead to death. The interesting part about hibiscus tea is that many research have proven that it can promote liver health and help it to work optimally. Hibiscus tea is highly rich in polyphenols. Polyphenols are compounds that have been proven to possess powerful properties that fight against cancer. Test tube studies have also discovered impressive results as regards the potential effect of hibiscus extract on cancer. 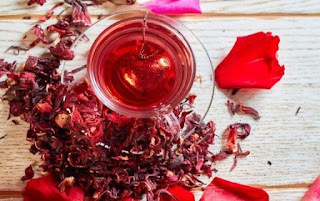 Apart from it having antioxidant and anticancer properties, other studies have proven that hibiscus tea could help fight against bacterial infections. To precise enough, a particular study discovered that hibiscus extract inhibited the activity of Escherichia coli, a strain of bacteria that is capable of causing various digestive disorders. If for some time now you are only enjoying the zobo drink or hibiscus tea because of its nice flavour and taste, having a knowledge of its health benefits is an added advantage. With this, it give you more reason to keep having more drink of this wonderful beverage. If you find this article informative enough, kindly use the share buttons below to pass this message across to your friends on various social media. You can also subscribe to Enhanced Health Fact blog for more useful information from the field of health, Enter your email on the subscription box found on this page ad hit the "subscribe" button.